Throughout the grand history of the thoroughbred, sire line dynasties have come and gone. The great sire Hyperion founded one of the more enduring lines during his stud career in the mid decades of the twentieth century. His influence streamed across every racing jurisdiction in the world and was considered as one of the most potent tail male lines in existence. The most enduring branch has come from Hyperion’s grandson Star Kingdom, who established a dynasty of immense importance in Australia. Star Kingdom came into the world at Cloghran Stud in Ireland on April 30, 1946. His sire was Stardust, a 15.2 hands stakes winning son of Hyperion who won the National Breeder’s Produce Stakes and the Guernsey Produce Stakes. Stardust placed second in the classic 2000 Guineas and St. Leger Stakes. As a sire he was not of the elite sons of Hyperion, but he was successful none the less. The dam of Star Kingdom was unraced Impromptu, a daughter of July Cup and Nunthorpe Stakes winner Concerto. Since Stardust won his races at less than a mile and Concerto was an out and out sprinter, Impromptu’s little chestnut colt was regarded as a similar type and was very small. The first four generations of Star Kingdom’s pedigree did not contain large horses. When looking into the pedigree of Star Kingdom, we see that he is inbred 4×4 to the double classic winner Sunstar. Sunstar won both the 2000 Guineas and the Epsom Derby. He had an excellent record of six wins from nine starts and was placed in two other races. Sunstar was a good but brief sire as he died at the age of fourteen. Further into Star Kingdom’s pedigree we see the name of Lord Derby’s epoch foundation mare Canterbury Pilgrim twice in Star Kingdom’s fifth generation, through her outstanding sire sons Chaucer and Swynford. Canterbury Pilgrim is also found in the seventh generation along the tail female line of Star Kingdom. There was some stoutness however in the little colt’s pedigree as the great stayer Papyrus was the sire of his second dam. The breeder of Star Kingdom was Richard Ball. He was dismayed at the very small size of the colt. However, the little chestnut would develop sturdy legs and was very lively and strong for his size. Ball sold him as a yearling to Wilfred Harvey for 3,100 guineas at the Doncaster sales. The colt was named Star King, and competed under this name for his entire racing career. He was renamed Star Kingdom when he arrived in Australia for his stud career due to name duplication in that country. Star King ran to his pedigree. He was one of the top juveniles of his generation winning the Gimcrack Stakes, Richmond Stakes, Sandown Produce Stakes and Sorrell Stakes. He broke his maiden in his first start with a ten length victory in the Manton Stakes. He was second to the great Abernant in the National Breeder’s Produce Stakes. Star King as a three year old won three more stakes races, the Greenham Stakes, Jersey Stakes and Hungerford Stakes. He ran third to rival Abernant in the July Cup. Harvey looked to sell Star King for stud after his three year old season. However, Clifford Leigh had other ideas and bought Star King to keep him in training for a four year old campaign. The effort was not as successful as hoped, as Star King could only win one stakes race, the five furlong Coronation Stakes at Chester. He made four more starts after this season opening win, but could only muster a second place finish to Hyperbole in the Hungerford Stakes. Leigh advertised Star King for sale as a stud prospect. There was some interest in him from English and Irish breeders, but nothing would materialise. He accepted an offer of 4,000 pounds from the Australian triumvirate of Stanley Wooton, Reg Moses and Alf Ellison. The potential stallion was on his way to the land down under for his new career. The long voyage however took a measure of fitness on Star King, as when he arrived in Sydney he had lost a lot of weight. Coupled with is diminutive size, he looked worse for wear when his new owners saw him for the first time. They were in a word aghast by their purchase. Now going by the name of Star Kingdom upon his arrival, the new stallion prospect recovered quickly enough from his strenuous journey and would travel on to Baramul Stud in New South Wales. Since he was only 15 hands ½ inch tall, many of the Australian breeders were reluctant to send mares to him. It did not dawn on many breeders that his grand sire Hyperion was only a half inch taller and was by this point in time one of the most decorated stallions on the planet. Those who hesitated would then clamour for the services of Star Kingdom once his first crop came of racing age. Star Kingdom exploded on the Aussie breeding scene with this first crop of two year olds. This crop contained champion two year old Kingster, winner of the AJC Breeder’s Plate. He would go on to capture the VRC Newmarket Handicap, W.S. Cox Plate, AJC Sire Produce Stakes and the AJC All Aged Stakes. Kingster won twelve of forty races. Also in the first crop of Star Kingdom foals was the crack filly Ultrablue. Two days after Kingster’s victory in the AJC Breeder’s Plate, Ultrablue won the AJC Gimcrack Stakes. Star Kingdom became the leading sire of two year olds in Australia with his first crop. The hot start to his stud career announced Star Kingdom with a bang to Australian breeders. His first crop was a harbinger of more success to come from the little chestnut stallion. Star Kingdom was now on his way to become the dominant sire in Australia, and in so doing, raised the bar high with his sons and daughters. He eventually led the Australian sire list five times, the Australian two year old sire list seven times and the broodmare sire list three times. Let us take a look at some of his best get. Todman was arguably his best. A small 15.2 hands chestnut in his sire’s image, Todman was bred in 1954 by Baramul Stud from the mare Oceana by Colombo. Todman won ten of twelve races from the age of two to his five year old year. He did not race as a four year old. He was the champion two year old of his generation and later became a champion sire when he was retired from racing. Todman was the inaugural winner of the prestigious Golden Slipper Stakes, thus becoming the first of five consecutive winners of this race sired by Star Kingdom. The two year old season by Todman was legendary. He won not only the Golden Slipper, but also the AJC Juvenile, AJC December Stakes, STC Welter Handicap, and the AJC Champagne Stakes. He was second to another great one in Tulloch in the AJC Sires Produce Stakes. As a three year old Todman won the Canterbury Guineas and Hobartville Stakes but would pull up during the running of the Hill Stakes, for his only off the board finish. The injury kept Todman away from the track for his entire four year old season. His owners could have sent him to stud, and in today’s style of thoroughbred ownership this would have happened. Since Baramul was standing his sire and were keen to promote Star Kingdom’s get, they decided to prepare Todman for a five year old campaign. Although he made only three starts, Todman went undefeated as a five year old in winning the STC Flying Handicap, VRC Lightning Stakes and VATC Futurity Stakes. All of the races Todman entered were before the advent of the graded/group rating for class. Of the ten races he won, five are long established group one events. Sent to stud in 1960, Todman stood beside his father and sired thirty stakes winners including Golden Slipper winners Eskimo Prince and Sweet Embrace. Other top stakes winners he sired are Blue Diamond Stakes winners Blazing Saddles, Crewman and New Gleam, as well as Imposing (AJC Epsom Handicap, George Main Stakes, leading sire), Ricochet (AJC Epsom Handicap, George Main Stakes, AJC Warwick Handicap), and Hemisphere (AJC Carrington Stakes). Todman was a two time leading sire of two year olds in Australia. Todman died at Widden Stud four years after he was relocated there in June of 1976, and was returned to Baramul to be buried beside his sire. A life sized statue of the great horse stands prominently at Rosehill Gardens, the home of the Golden Slipper Stakes, in his honour. A full brother was bred two years after Todman by Baramul. Given the name Noholme, the brother was not as brilliant on the track as Todman. Noholme was similar in size and colour as his brother and his sire and became a very durable and well raced horse. Noholme made forty-one starts, winning twelve and placing in eleven other races. He won the W.S. Cox Plate in course record time and also took the AJC Epsom Handicap as a three year old against older competition, as well as the C.B. Fisher Plate, Champagne Stakes and the Hill Stakes. He was named as the top three year old for the 1958-59 racing season. Noholme was purchased by American Gene Goff in 1960 and sent to the western continent to race for his new owner. He did not win any stakes races but did place prominently in all four of his starts. He would be known as Noholme II in the U.S. due to name duplication. Goff retired his Australian import to stand stud at his Verna Lea Farm in Arkansas. Since Arkansas is not one of the elite states for thoroughbred production, Noholme did not receive many well bred mares. However he would carve out a very solid and upwardly improving record in the role. He became the leading sire in North America of two year old winners in 1968. Goff sold Noholme II to Robin’s Nest Farm in Ocala Florida for one million dollars in 1967. In 1974 he was transferred to Lasater Farm in Ocala. 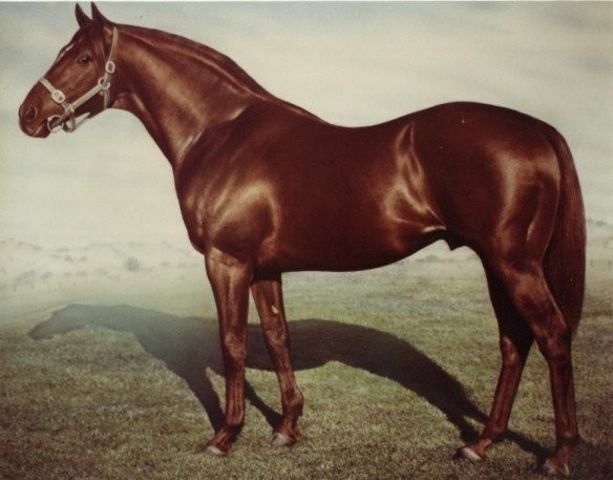 Among the forty-five stakes winners sired by Noholme II were champion sprinter Shecky Greene (sire of champion Green Forest), Fools Holme (South African Horse of the Year), champion filly Carnauba (Premio Oaks d’Italia), Multi French stakes winner General Holme and two times champion handicap horse in North America Nodouble. Nodouble was bred and raced by Goff in Arkansas, hence Nodouble’s nick name “The Arkansas Traveler” during his successful racing career. Nodouble won such prestigious races as the Arkansas Derby, Hawthorne Gold Cup twice, Brooklyn Handicap, Santa Anita Handicap, Californian Stakes, Metropolitan Handicap, and the Michigan Mile Handicap. Goff retired Nodouble from racing in 1970 to stand stud first in California and then on to Kentucky. His success was limited in both these jurisdictions and he was subsequently relocated to Lasater Farm in Florida. Here Nodouble would find the perfect mare population to compliment him. Nodouble became the leading sire in North America in 1981. He sired ninety-one stakes winners when all was said and done in his stud career and added another eighty-nine stakes winners as a broodmare sire. Nodouble is the sire of some memorable horses such as Mairzy Doates (inaugural Japan Cup, Matchmaker Stakes, Yerba Buena Stakes twice), Double Discount (Carleton F. Burke Handicap, San Carlos Handicap). The great broodmare No Class who is the dam of champions Sky Classic, Regal Classic, Grey Classic, and Classy ‘N Smart, and is the grand dam of Dance Smartly and Smart Strike, is his best known broodmare daughter and has kept the name Nodouble prominently in world class pedigrees. The top racing offspring of Nodouble however is two time Canadian Horse of the Year Overskate. A smallish chestnut in keeping with his tail male line ancestors, Overskate became a popular and consistent campaigner all around North America. He won graded stakes races on dirt and grass, at distances ranging from seven furlongs to twelve furlongs and beat such good ones as Glorious Song, Dom Alaric, L’Alezane, Bowl Game and Golden Act. Among his victories were the Prince of Wales Stakes, Breeder’s Stakes, Laurence Armour Handicap, Bowling Green Handicap and the Stars and Stripes Handicap. Overskate won twenty-four of forty-two races in his Hall of Fame Career. Returning to Australia and the sons of Star Kingdom, we see multi stakes winner Sky High. This very durable and frequent stakes winner won twenty-nine of his fifty-five races, with ten second place finishes and nine thirds. Sky High was inbred to Hyperion 3×3 as his dam sire Helios was a son of Hyperion. Among the lucrative and prestigious races Sky High won were the Golden Slipper, Victoria Derby, AJC All Aged Stakes, AJC Warwick Stakes twice, STC Canterbury Stakes twice,, VATC Caulfield Stakes twice, AJC Champagne Stakes, and the AJC Autumn Stakes. He won stakes races ranging in distance from five furlongs to twelve furlongs. Sky High began his stud career in Australia at Woodlands Stud, where he sired the good stakes winners Sky Call, Obelia, Captain Kirk and Skyperion. He was sold to an American syndicate headed by A.B. “Bull” Hancock and relocated to Claiborne Farm in Kentucky. He went by the name of Sky High II during his time in Kentucky. He was a solid if unspectacular sire in the U.S. and has to his credit Eclipse Award champion handicap horse Autobiography, winner of the Jockey Club Gold Cup, Discovery Handicap and San Fernando Stakes. Unfortunately for his connections, Autobiography broke down in the San Luis Obispo Stakes and was humanly euthanized. Sky High was the younger brother of another Golden Slipper winner by Star Kingdom named Skyline. Skyline added the AJC Juvenile Stakes, the STC Hill Stakes and the AJC Derby to his list of stakes victories on his resume. While we are on the subject of full siblings sired by Star Kingdom, Todman and Noholme had two other full brothers to race, Shifnal and Faringdon. Neither was as successful as their famous older brothers but did add to the family fortunes none the less. Shifnal sired seventeen stakes winners and was a leading sire of two year olds in Australia. Jandell in New Zealand and Sun Monarch in South Africa were both champions sired by Shifnal. Faringdon stood in Australia for seven years until he was transferred to Japan in 1973. His most significant offspring were Navajo Brave and Sabron. Star Kingdom is the sire of Fine And Dandy (Golden Slipper Stakes, AJC Sires’ Produce Stakes), Time And Tide (AJC Sires’ Produce Stakes, Champagne Stakes), Star Of Heaven (Craven Stakes, VRC Racing Club Stakes), Kaoru Star (Hopeful Stakes, sire of sixty-nine stakes winners), and Planet Kingdom (AJC Craven Plate, Tattersall’s Cup). The latter is one of the better distance horses from the Star Kingdom tribe and became a reliable source for offspring in his mold. Planet Kingdom sired the good stakes winners Ming Dynasty, Mighty Kingdom, Just Ideal, Leica Planet and Cosmic Planet. The son of Star Kingdom who would continue the longest surviving branch of the sire line is Biscay. A full brother to Star Of Heaven and stakes winner Tattenham, Biscay scored in the Maribyrnong Plate and the Merson Cooper Stakes, two of his six total victories from eight races. Biscay was syndicated to stud and stood at Bhima Stud in New South Wales in 1969. He became a reliable source of early developing speed, much in his sire’s tradition. Biscay was the leading first crop sire in the 1972-73 season and later became a two time champion sire of juveniles in his career. Biscay is the sire of such good stakes winners as Bounding Away (six group one wins including the Golden Slipper), Biscadale (VATC 1000 Guineas), Shaybisc (AJC Sires’ Produce Stakes), Lowan Star (Queensland Oaks, AJC Oaks), Mahaasin (Blue Diamond Stakes), Belle Chanson (SAJC Australasian Oaks), and two Oakleigh Plate winners in Scarlet Bisque and Zephyr Bay. Two sons of Biscay became leading sires in Australia. One of which was a bright red chestnut named Marscay, foaled in 1979 at Woodlands Stud. Marscay won the Golden Slipper, keeping his sire line prominent in success for this prestigious race, as well as the Hobartville Stakes over the very good Strawberry Road. Retired to Widden Stud in Hunter Valley, Marscay sired sixty-two stakes winners which includes Golden Slipper winner Bint Marscay, two AJC Oaks winners in Circles of Gold and Triscay, as well as Jetball (AJC Galaxy Stakes), March Hare (STC George Ryder Stakes, AJC Champagne Stakes, AJC George Main Stakes), Excellerator (AJC Epsom Handicap), Great Command (New Zealand Derby, Whakanul International), and Blazing Sword (VRC Breeder’s Champion Stakes). The other son to carry on the Star Kingdom line with his own prosperous Biscay branch was Bletchingly. Bred by Baramul in 1970, the dark brown almost black Bletchingly won four of five races in a brief but productive racing career. His biggest moments on the track came in the AJC Galaxy Stakes at Randwick, and a record setting performance at Flemington in the Moomba Handicap. He retired from racing to stand stud at Widden Stud and with his first crop, got off to a flying start in his new role. From this first crop came the legendary Kingston Town, winner of fourteen group one stakes races including three triumphs in the W.S. Cox Plate, two wins in the George Main Stakes, as well as resounding wins in the Rosehill Guineas, AJC Derby, Sydney Cup, Caulfield Stakes and Caulfield Cup. Kingston Town won thirty of forty-one races and is an inaugural member of the Australian Horse Racing Hall of Fame along with other national legends such as Phar Lap, Tulloch, Carbine and Bernborough. Bletchingly became a three time leading sire in Australia. Among his top get are champion Emancipation (George Main Stakes, Doncaster Handicap, George Ryder Stakes twice, AJC All Aged Stakes, Coolmore Classic), Canny Lass (VATC Marlboro Cup, Elders Mile, William Reid Stakes), Coronation Day (George Main Stakes), Kenny’s Best Pal (VRC Australian Guineas), Best Western (AJC Spring Champion Stakes), True Version (VRC Sires’ Produce Stakes, Champagne Stakes), Wrap Around (William Reid Stakes), Boardwalk Angel (SAJC Goodwood Handicap), Spirit of Kingston (VRC Oaks, STC Rosehill Guineas, STC Canterbury Guineas), and two Golden Slipper winners in Star Watch and Canny Lad, the latter being a full brother to Canny Lass. Canny Lad also captured the VRC Sires’ Produce Stakes and the Maribyrnong Plate to be named as the champion two year old in Australia. Before embarking on a very successful stud career at Darley’s Woodlands Stud in New South Wales, he won the VATC Tattersalls Stakes in 1991. Canny Lad sired group one winners such as champion Calveen (ARC Easter Handicap), Accomplice (AJC Galaxy, Doomben Handicap), Ancient Song (Salinger Stakes), Allez Suez (AJC Epsom Handicap), Small Minds (AJC Australian Oaks), Republic Lass (AJC Australian Oaks, Ranvet Stakes), Dodge (AJC Epsom Handicap, Queensland Derby), Preserve (VRC Sires’ Produce Stakes), and He’s No Pie Eater (Rosehill Guineas, Chipping Norton Stakes). Canny Lad has had a significant impact on breeding through his daughters, especially his daughter Shantha’s Choice. A winner of one race from two starts, Shantha’s Choice is the dam of champion racer and sire Redoute’s Choice. On the track, Redoute’s Choice won the Caulfield Guineas, Blue Diamond Stakes, C.F. Orr Stakes and the Manikato Stakes. At stud he is a two times leading sire with the likes of Snitzel, Miss Finland, Stratum, Samantha Miss, Undoubtedly, Nadeem and Lotteria to name but a few. Shantha’s Choice is also the dam of group one stakes winner Manhattan Rain (AJC Sires’ Produce Stakes) and Platinum Scissors (AJC Spring Champion Stakes). Buried at Woodlands following his death in 2014, Canny Lad had been the most prominent representative of the Star Kingdom male line in the twenty-first century. The hallmark of the line has been precocious early speed, and plenty of it. There have been many durable and sound descendants that trained on to become wonderful handicappers and stakes winners beyond their two year old season, but the prevailing highlight of the Star Kingdom line was brilliant two year olds. Unfortunately, for fans of this great and noble sire line, there are fewer and fewer representatives of the Star Kingdom line in existence. At one time, and as recently as fifteen years ago, twenty-two percent of the stallions in Australia and New Zealand were on the Star Kingdom tail male line. While the line is not extinct, it is in danger of becoming so. Star Kingdom was, in my opinion, ahead of his time. In the breeding world today, much emphasis is placed on early developing and very fast two year olds. Star Kingdom sired a plethora of such horses and in so doing, blazed the trail. Many of today’s quick developing two year olds have Star Kingdom somewhere within their pedigrees, but not many from the direct male line. The fact that he sired the first five winners of the Golden Slipper and his sons and grandsons sired nine more, as well as an additional five winners by other sire lines from mares with Star Kingdom in their pedigrees, shows the way. Speaking of Star Kingdom broodmares, some in particular must be mentioned here. Dark Jewel produced five stakes winners, including champions Baguette (Golden Slipper Stakes, Champagne Stakes) and Heirloom (Maribyrnong Plate, VATC 1000 Guineas), as well as Cabochon, Birthright and Betelgeuse. Baguette would be an outstanding sire getting Golden Slipper winner Dark Eclipse, while Baguette’s son Crown Jester sired Golden Slipper winner Rory’s Jester. A few more Star Kingdom broodmares of note are Ritmar, dam of stakes winner Agronomist and the good New Zealand sire Taipan. Concert Star is the dam of champion Academy Star, while Reveille was the dam of multi stakes winners Reality, Ethnarch and Savings. Starquita produced multi stakes winner With Respect, who in turn is the dam of three stakes winners. Star Kingdom lived to be twenty-one. He passed away from a bowel blockage on April 21, 1967. He is buried at Baramul along with his son Todman who had served stallion duties alongside his illustrious father. It has been said that Star Kingdom was none too pleased with having Todman around however. Since Todman was such a popular champion from the race course, many visitors would go to see him first, and not Star Kingdom as had been the way before his son’s arrival. Star Kingdom displayed his resentment by turning his back to the visitors when approached. If he was the first to be visited, he would become very engaging and friendly. Despite his diminutive size, Star Kingdom was a giant in the breeding world. Some of the greatest sires in history have been small in stature, big in accomplishment. Who says size is everything, certainly not Star Kingdom nor his get and his admirers. His descendants owned the Golden Slipper Stakes for the first decades of the race’s running. That alone is testament to his ability to sire top class two year olds. Star Kingdom established one of, if not the most successful extensions of the Hyperion line in the world. Star Kingdom actually became a dynasty fore bearer in his own right. I truly hope that his tail male line can survive to future generations. Big things from a small package. Speed speed speed. He had a lot of durable colts and fillies too. Great sire. Very interesting article. My 29 year old Appendix mare is Noholme, Nodouble, Double Drift and Hyperion lines on top. Her name is Star Driftin. We love her and are so proud of her geneology. Such an interesting article. I had a Mr. Prospector grandson out of the Nodouble mare Dawn’s Fancy, and he must have taken after his dam’s side of the family; he was a 15.1 1/2 chestnut with no chrome. He looked very like the picture of Star Kingdom. He was a lovely sport horse and I was very happy to read about his relatives. Thank you!